According to a report released today by the U.S. Census Bureau, the number of uninsured Americans under age 65 fell from 49.2 million in 2010 to 47.9 million in 2011. When including those 65 and older, the number of uninsured Americans fell from 50.0 million to 48.6 million over this period. MORE: For analysis of poverty and income trends, see Already more than a lost decade: Poverty and income trends continue to paint a bleak picture. While the Great Recession officially ended in the summer of 2009, the labor market continued to deteriorate into 2010 and stagnated in 2011. As most Americans, particularly those under age 65, rely on health insurance through the workplace, these labor market trends make it no surprise that employer-sponsored health insurance coverage rates fell in 2011. But the situation started deteriorating long before the Great Recession: Employment-based coverage has not increased in 11 years, falling a total of 10.8 percentage points since 2000, to 58.3 percent in 2011. 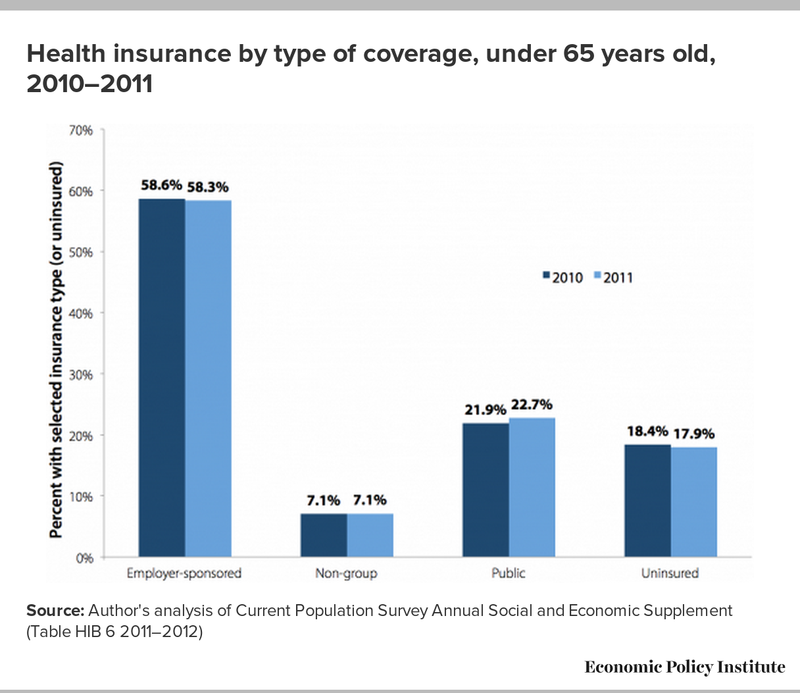 In 2011, 47.9 million people under age 65 were uninsured, down from 49.2 million in 2010. However, the number of uninsured non-elderly Americans is 11.7 million higher than in 2000. The share of non-elderly Americans with employer-sponsored health insurance has fallen for 11 years in a row, declining 10.8 percentage points since 2000 to 58.3 percent in 2011. The only reason why the decline in the employer-sponsored insurance rate from 2010 to 2011 did not translate into an increased share of non-elderly Americans with no insurance is that over 2 million more people under age 65 were covered by Medicaid or the Children’s Health Insurance Program (CHIP) in 2011 than in 2010. Critical provisions in the Patient Protection and Affordable Care Act (also known as health reform) helped offset the declines by insuring young adults on their parents’ health insurance policies. The uninsured rate for young adults, those 19–25 years old, declined 2.2 percentage points from 2010 to 2011, far more than for any other age group. Employer-sponsored health insurance (ESI) remains the predominant form of coverage for those under age 65. In 2011, however, the rate of coverage fell over the year (as shown in Figure A). 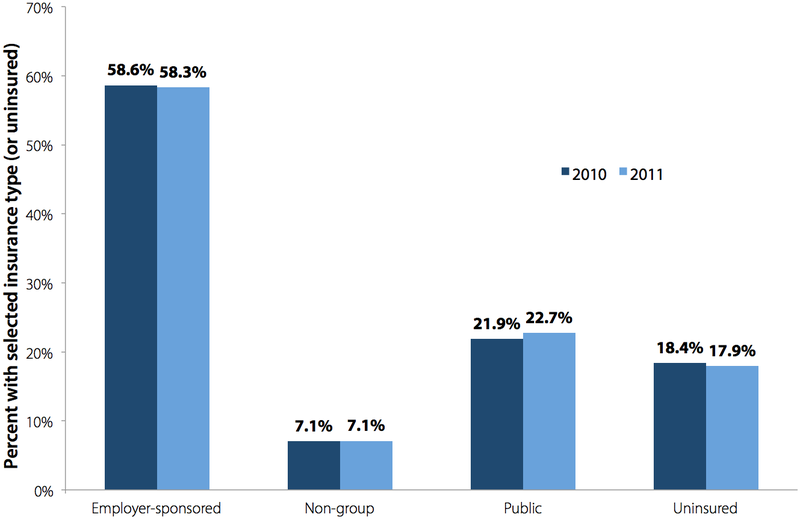 Non-group coverage (individually purchased private insurance) was flat from 2010 to 2011, while public coverage rose significantly, from 21.9 percent to 22.7 percent. Despite the decline in ESI coverage, this increase in the share of Americans covered by public insurance has kept the total share without insurance from rising in 2011. 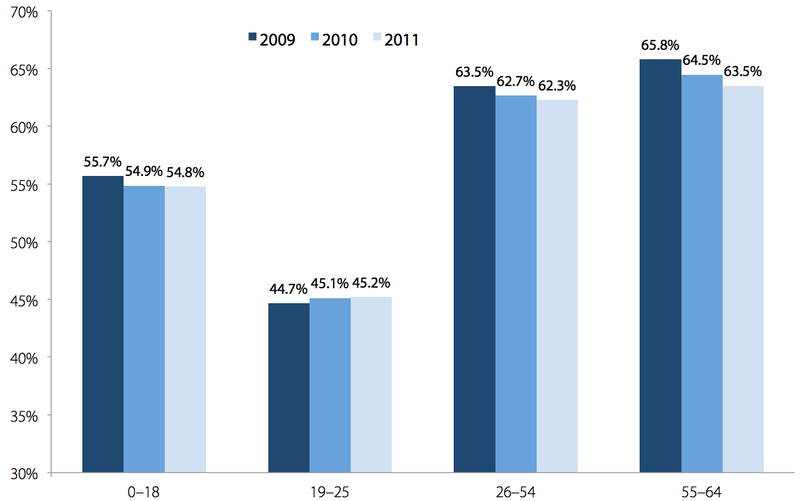 In fact, the share of uninsured Americans under age 65 declined from 18.4 percent in 2010 to 17.9 percent in 2011. The Census report suggests evidence of further unraveling of the employer-based coverage system, as the share of persons covered through work (either their own employer or that of a family member) declined for the 11th year in a row. As shown in Figure B, ESI covered 58.3 percent of people under age 65 in 2011, down from 58.6 percent in 2010. 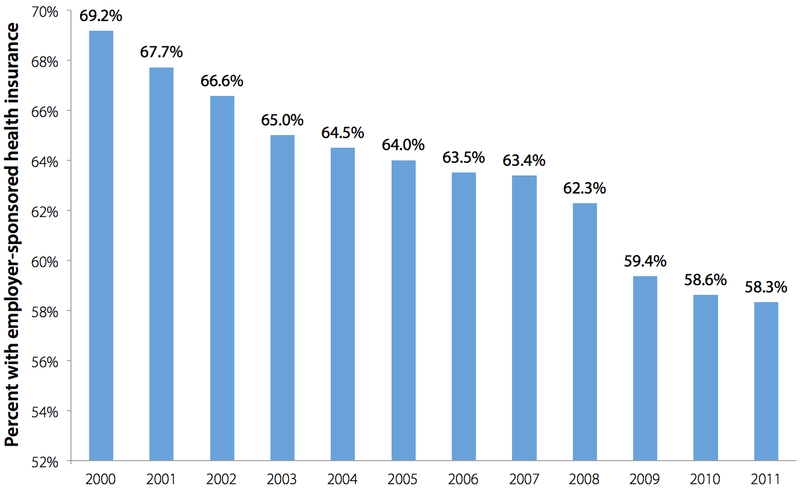 The share declined by 10.8 percentage points from 2000 to 2011. 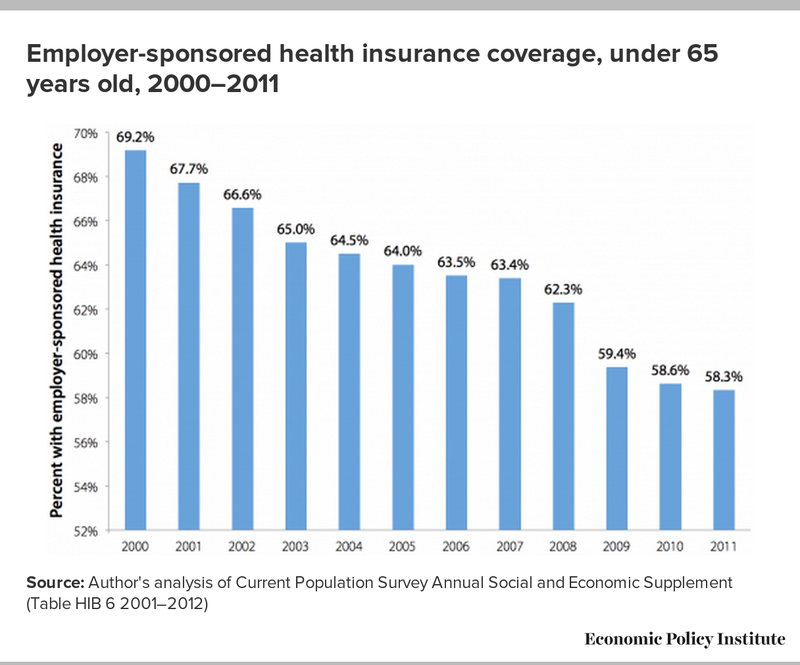 Figure C illustrates the incidence of employer-sponsored health insurance across various age groups in 2009, 2010, and 2011. Adults age 55–64 consistently have the highest workplace coverage rates, while young adults (age 19–25) have the lowest. 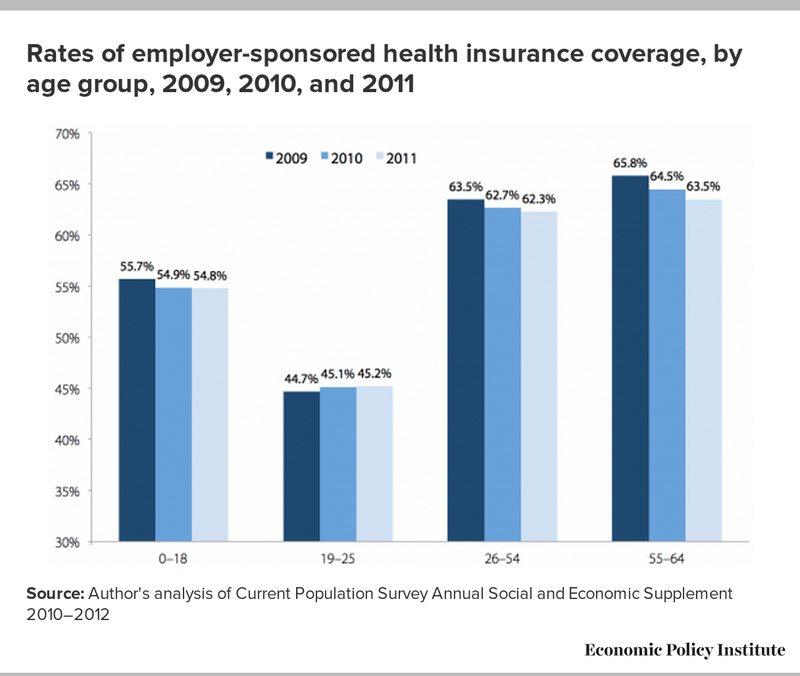 For young adults, health reform played a key role in preventing a decline in workplace coverage. The Patient Protection and Affordable Care Act includes provisions that allow young adults up to age 26 to secure health insurance coverage through their parents’ employer-sponsored health insurance policies. Between 2009 and 2010, the only age group that experienced statistically significant increases in overall coverage was 19–25 year olds, and between 2010 and 2011, they experienced the largest increase. Their uninsured rate fell a significant 1.6 percentage points in 2010 and then another 2.2 percentage points in 2011. 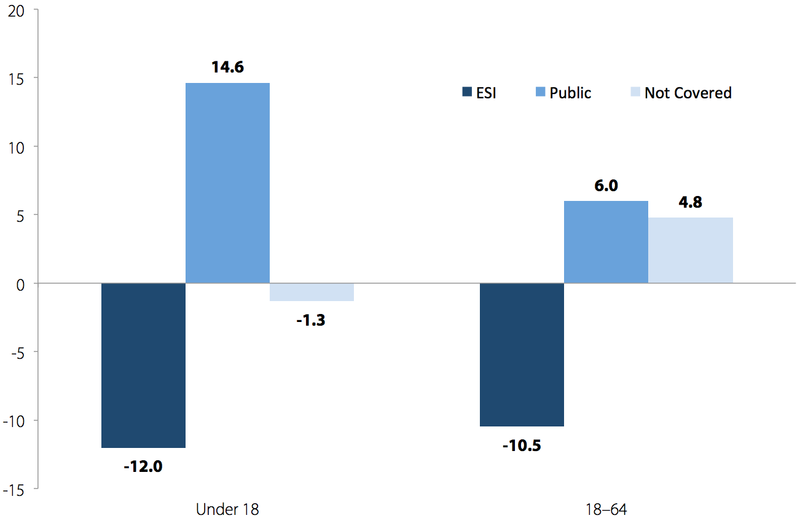 Looking closely at changes in employer-sponsored insurance since the young adult provision took effect in mid-2010, it is clear that young adults are going against the trend. Since the job market was not disproportionately favorable toward young adults, it is clear these positive trends are due to the Affordable Care Act. 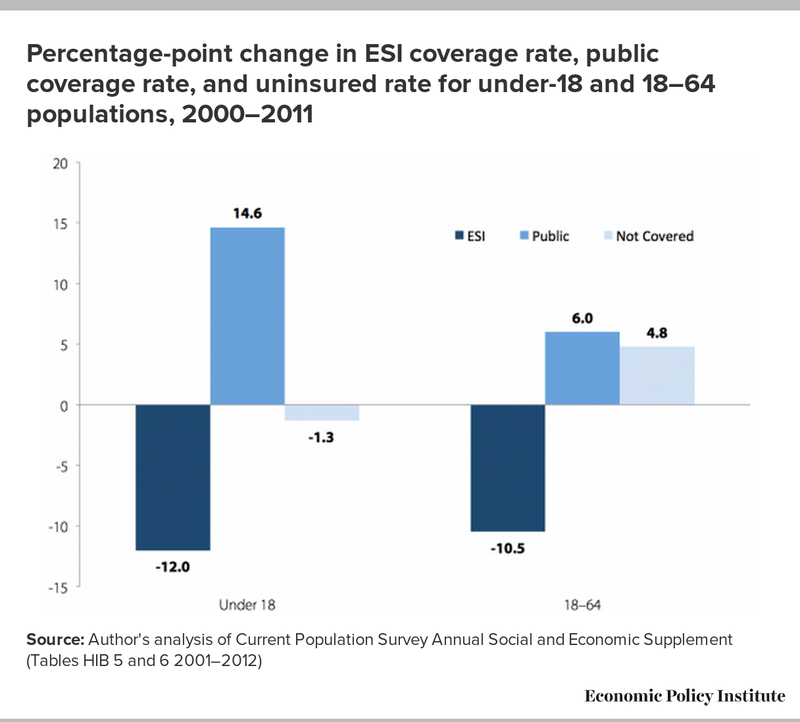 ESI coverage for the young group (those under age 19) continued its unabated decline, falling 0.9 percentage points between 2009 and 2011, from 55.7 percent to 54.8 percent. The coverage of children (strictly under 18) through the employment-based system has fallen 12.0 percentage points since 2000. The total share of uninsured children fell over the last year, however, as their Medicaid/CHIP coverage rates continued to rise, increasing from 34.8 percent in 2010 to 35.5 percent in 2011. Over the decade, it is clear how public insurance has shielded children from the declines in employer-sponsored insurance. Figure D shows the aforementioned 12 percentage-point decline in the share of children with employer-sponsored health insurance from 2000 to 2011. Meanwhile, the share of children covered by public insurance rose 14.6 percentage points (primarily due to Medicaid/CHIP), ultimately leaving fewer children uninsured. Non-elderly adults have not been so fortunate. Those between ages 18 and 64 experienced a 4.8 percentage-point increase in the share uninsured from 2000 to 2011. Unlike children, their ESI losses were not fully offset by increasing public coverage. The data released today by the U.S. Census Bureau highlight that the current system does not provide stable and secure coverage for many Americans. The share of Americans under age 65 with employment-based health coverage fell for the last 11 years, dropping from 69.2 percent in 2000 to 58.3 percent in 2011. The share of uninsured Americans under age 65 rose from 14.7 percent in 2000 to 17.9 percent in 2011. However, this 17.9 percent share in 2011 is a decline from 18.4 percent in 2010; looking at the numbers released by the U.S. Census Bureau, it is clear that government insurance and health reform together account for this decline. The phase-in of the Patient Protection and Affordable Care Act over the next few years should eventually stem any additional losses and reverse the current trend, covering millions more Americans.